“A legendary official Red Ryder 200-Shot Carbine Action Range Model Air Rifle with a compass and this thing which tells time built right into the stock!” That’s all that 9-year-old Ralphie wants for Christmas in the third annual production of the play A Christmas Story by the Evansville Community Theatre. Unfortunately, his mother, teacher, and even Santa all have the same answer: “You’ll shoot your eye out!” All the elements from the beloved motion picture are here, including the family’s temperamental smoking furnace; Scut Farkas, the school bully; the boys’ experiment with a wet tongue on a cold lamppost; and, of course, the well-known leg lamp. See it all live, on stage, November 30 and December 1 at the Evansville Performing Arts Center in Evansville, 640 South 5th Street. Performances are Friday, November 30 at 7 p.m. and Saturday, December 1 at 2 p.m. and 7 p.m. Tickets will be available at the door or can be purchased at the Evansville Hometown Pharmacy, Kopecky’s Piggly Wiggly, and Bank of Evansville. Tickets can also be reserved in advance by clicking here. Tickets are $9 for adults, $6 for children/students. The production is getting an upgrade this year by moving to the state-of-the-art, 600-seat Evansville Performing Arts Center. In 2010 and 2011, the show was performed in Evansville’s much smaller, and older, J. C. McKenna Auditorium. This year’s production will benefit from more comfortable seats, an ample stage, and new technical effects on lights and sound. The performance has been streamlined for families with children, running approximately two hours, including intermission. as the teacher, Miss Shields. New cast members are Jack Innes as Ralphie Parker, the boy who badly wants that bb gun for Christmas; Peyton Scarpaci is Ralphie’s friend Schwartz; Kaylee O’Connor plays Ralphie’s little brother Randy; Alex Wille is the bully Scut Farkas; and Roxanne Joos appears as Ralphie’s ultra-smart classmate Helen Weathers. While most of the cast and crew are from Evansville, Jack Innes is from McFarland while Roxanne Joos is from Beloit. Both have appeared in productions elsewhere, but will make their debut with the Evansville Community Theatre in A Christmas Story. In another switch, David Sobeski, who brought the production to Evansville as director in 2010 and 2011, will be on stage this year as the Old Man, Ralphie’s father. Lyman Fuson, who has been heavily involved in the past two productions, is director this year. 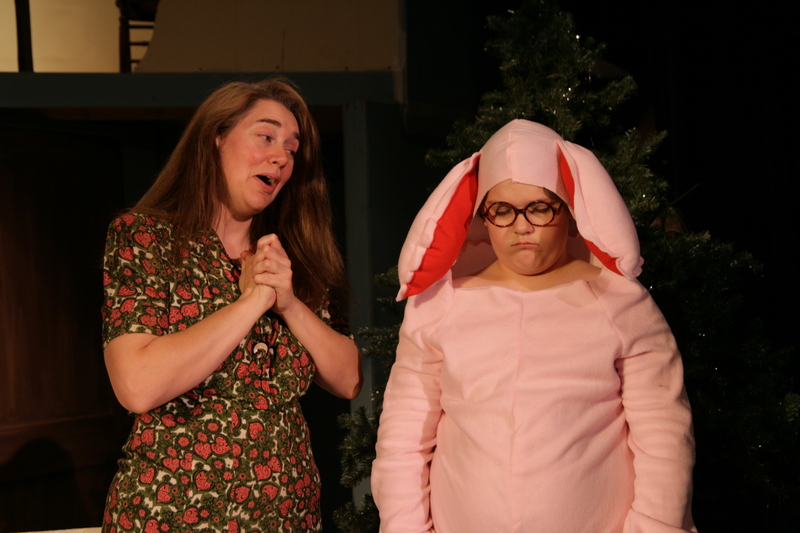 For the behind-the-scenes scoop on what it’s like to put A Christmas Story on stage, check the director’s Evansville Community Theatre blog. The play, adapted by Phillip Grecian, is based on humorist Jean Shepherd’s memoirs of the humor, intrigue, and childhood angst which were all part of growing up in the Midwest in the 1930s and 40s. Many of the incidents in the movie are from Shepherd’s book In God We Trust: All Others Pay Cash. Shepherd’s most popular and well-known work, of course, is the film A Christmas Story, which he co-wrote and narrated. When the movie opened in theaters in 1983 it got mixed reviews. However, over the next few years the film became a cult hit until now it’s played in 24-hour television marathons during the holiday season. Evansville Community Theatre is making their performance of A Christmas Story an annual holiday tradition, too. 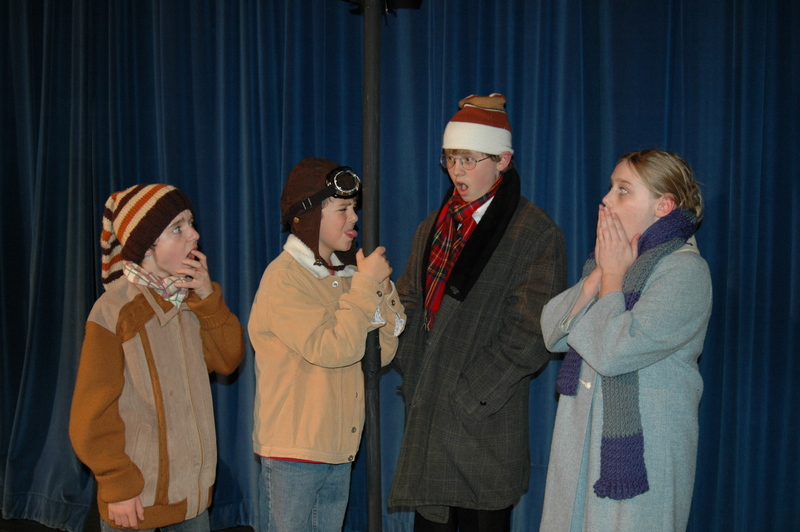 Check out a video story featuring scenes from Evansville’s 2011 production of A Christmas Story on Local Vision TV in Janesville, Wisconsin. Don’t miss this hilarious, nostalgic holiday treat. Just like Christmas, the chance to see A Christmas Story, live on stage, comes just once a year. Make it a tradition!